The Chief Executive of The Queen Elizabeth Diamond Jubilee Trust (the Trust), Dr Astrid Bonfield CBE, met with the Government of Belize and leading eye health experts to thank and commend them for their efforts to prevent blindness caused by escalating rates of diabetes across Belize. With the prevalence of diabetes in the Caribbean almost 50% higher than the global average, the Trust has been working with partners in the region since 2015 to help reduce the number of people at risk of blindness from its sight-threatening complication, diabetic retinopathy. In Belize, as a result of the Trust’s programme, through the Government’s leadership and by building on the services provided by the Belize Council for the Visually Impaired, Belize’s public health system has now been significantly strengthened to prevent more people with diabetes from losing their sight. Diabetes is the leading cause of blindness in working-age adults and affects 14.5% of the population in Belize, compared to the global average of 8.8%. Diabetic retinopathy occurs when poor control of blood sugar levels, high blood pressure and high lipid levels in the blood damage the blood vessels in the retina. If left untreated, it can lead to irreversible blindness. Over half of all people with diabetes are unaware they have the condition, and by the time their vision deteriorates is it often too late for treatment. Regular screening, early treatment, and careful health management is crucial to ensure people with diabetes do not go blind when their sight could be saved. As diabetes rapidly becomes a global epidemic, diabetic retinopathy is now one of the top causes of vision loss across the Commonwealth and worldwide. 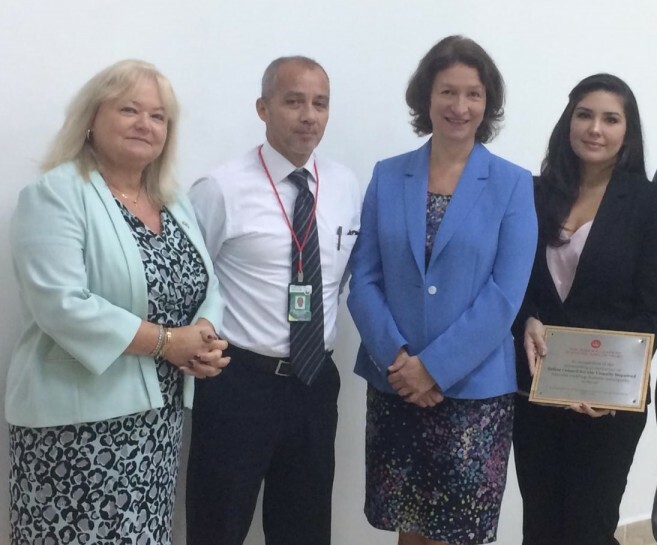 The Trust, together with its coordinating partner the London School of Hygiene and Tropical Medicine, has worked with the Ministry of Health to secure permanent changes to Belize’s public health system by integrating screening and quality treatment for diabetic retinopathy into the care provided to people with diabetes. By focusing on strengthening the health system, the aim has been to implement an effective screening and treatment plan that will not only protect the sight of those people who currently have diabetes in Belize but also those who in the future will develop the condition. As part of the measures taken to improve access to quality eye care for people with diabetes, equipment and training has been provided to health care professionals, and referral systems strengthened. Awareness raising campaigns have been delivered across the country to highlight the issue of diabetes and encourage healthy eating and exercise – two of the main ways to prevent the disease from developing in the first place. Information is made available to those with diabetes highlighting the risk it poses to sight and of the need to attend annual eye tests. Since 2015, more than 3,800 patients with diabetes have had their eyes screened and over 600 patients across the country have received treatment which has saved them from irreversible blindness. The aim now is to scale-up the screening and treatment services successfully implemented as part of this programme, to increase coverage and reach more people across the country who may be at risk of losing their sight. “I commend all that has been done so far to ensure that Belize has the systems in place to enable it to effectively tackle the world’s fastest growing cause of blindness. The efforts of the Government and our partners to increase public awareness of the condition and to improve eye care services is outstanding and is ensuring people are protected against this tragic and avoidable form of blindness each and every day. The Trust was established in 2012 to create a lasting legacy in honour of Her Majesty The Queen as Head of the Commonwealth. The work undertaken in Belize since 2015 to prevent people with diabetes from losing their sight now and in the future forms a core part of the Trust’s legacy.